Troy "Trombone Shorty" Andrews (born January 2, 1986) is a trombone and trumpet player from New Orleans, Louisiana, United States. Troy Andrews is the younger brother of trumpeter and bandleader James Andrews . Growing up in New Orleans' Treme neighborhood, "Trombone Shorty" was participating in brass band parades as a child, carrying his trombone even before his arms were long enough to reach all the positions of the slide. Andrews was a bandleader by the age of 6. Originally attracting attention for his youth, by his teens he was attracting attention for his musical virtuosity as well. Troy Andrews is the younger brother of trumpeter and bandleader James Andrews . 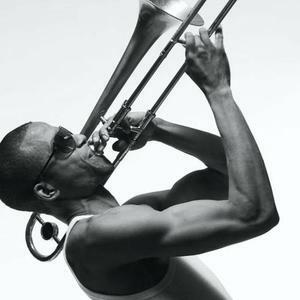 Growing up in New Orleans' Treme neighborhood, "Trombone Shorty" was participating in brass band parades as a child, carrying his trombone even before his arms were long enough to reach all the positions of the slide. Andrews was a bandleader by the age of 6. Originally attracting attention for his youth, by his teens he was attracting attention for his musical virtuosity as well. He attended the prestigious New Orleans Center for the Creative Arts (NOCCA). And as a graduate he joined the ranks of others like Wynton Marsalis, Branford Marsalis, Harry Connick, Jr., Irvin Mayfield and Nicholas Payton. In 2005, he was a featured member of Lenny Kravitz's horn section for a world tour that shared billing with acts such as Aerosmith. Six weeks after the levees failed in New Orleans on August 29, 2005, some of the city's greatest musicians came to Austin, Texas, to record a benefit CD called Sing Me Back Home at Wire Studios with producers Leo Sacks and Ray Bardani. With their lives in storm-tossed transition, the all-star collective was christened The New Orleans Social Club. Andrews was the featured guest on "Hey Troy, Your Mama's Calling You," a tribute to "Hey Leroy, Your Mama's Calling You" which was a Latin-jazz-soul hit for the Jimmy Castor Bunch on Smash Records in 1966. Andrews also performed on "Where Y'At" as part of The Sixth Ward All-Star Brass Band Revue featuring Charles Neville of the Neville Brothers. In London, during the summer of 2006, Andrews began working with producer Bob Ezrin and U2 at Abbey Road Studios. This association led to Andrews performing with U2 and Green Day during the re-opening of the New Orleans Superdome for the NFL's Monday Night Football pre-game show. To wrap up 2006, Andrews appeared on the NBC television series Studio 60 on the Sunset Strip. Leading a group of New Orleans musicians, he performed the holiday classic "O Holy Night" which drew such an enthusiastic response from viewers that NBC released the single for free download on their web site. Kicking off 2007, New Orleans' premier music magazine, Offbeat, named Andrews their Performer of the Year. He also garnered honors as Best Contemporary Jazz Performer. As of 2009, his current project is Orleans Avenue, a funk/pop/hip-hop mix including musicians Mike Ballard on bass, Dan Oestreicher on baritone sax, Clarence "Trixz?y" Slaughter on tenor sax, Pete Murano on guitar, Joey Peebles on drums, and Dwayne "Big D" Williams on percussion.